Just over 2 years ago I decided to take a sabbatical from the corporate world and spend some time guiding in the South African Lowveld, an area that has always had a magical hold over me. 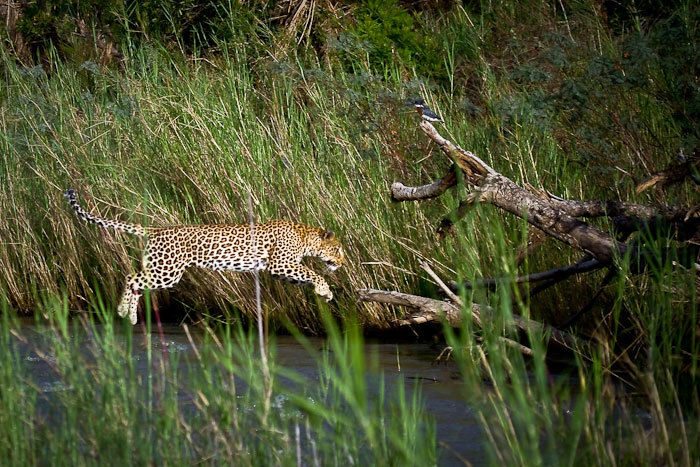 The Sabi Sand always had a certain allure largely due to its reputation for phenomenal leopard viewing. For as long as I can remember, I have felt an attachment to these cats. 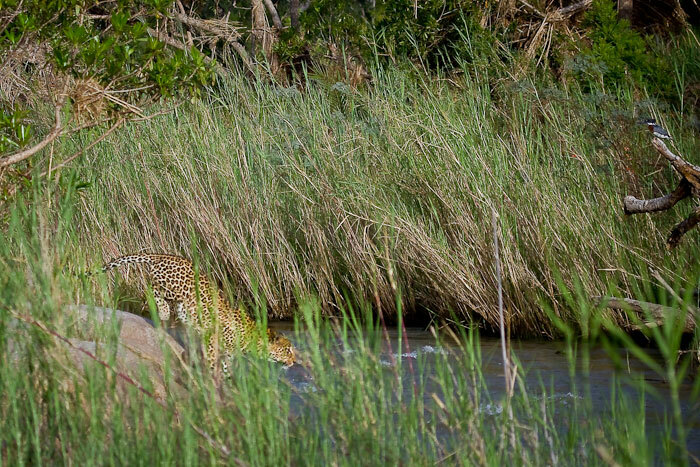 I can’t work out how or when this started, but it was likely a combination of their elusive nature, which makes a leopard sighting that much more special, combined with their sheer beauty which takes that rare sighting to another level. Although this was a somewhat naive view, it was the initial attraction and the catalyst for what would turn into something of a love affair. 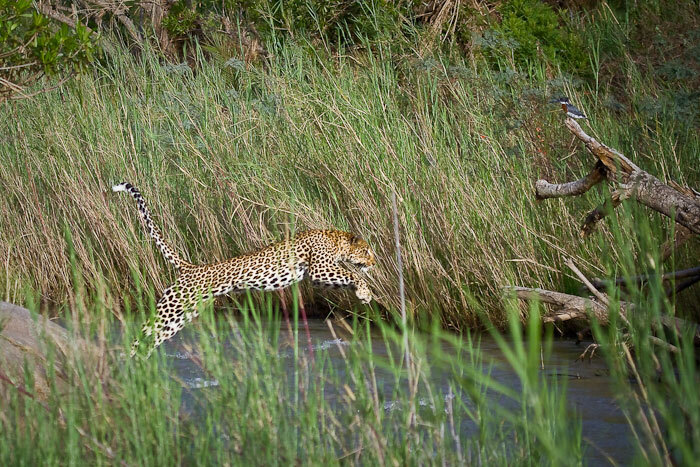 My time in the Sabi Sand has given me a whole new insight into the lives of leopards and I have spent hours on end watching and learning from these majestic creatures. I have had the privilege of being allowed to follow so many aspects of their daily lives. I’ve seen them mating, raising cubs, losing cubs, making kills, stalking their prey, running away from other predators, engaging in territorial battles and the list goes on. I have been able to follow and understand the personalities of individual leopards and have developed a level of attachment to particular animals that has made it difficult to leave, knowing I may never see them again. While guiding at a private concession in the Kruger National Park, I realised just how amazing the leopard viewing in the Sabi Sand really is and I felt a yearning to come home. I could not have asked for a better place to be than Londolozi. In my 6 weeks here I have not been disappointed, especially not by the leopards. I’ve seen 12 different leopards in the past month, forming part of the 38 different leopards I have seen in the past 2 years in an area of approximately 16,000 hectares within the central Sabi Sand. This is not something to be taken lightly and highlights just how remarkable this property is. 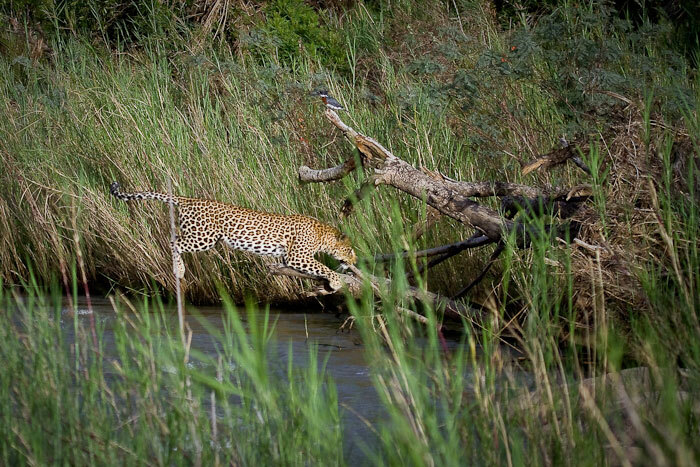 When given the opportunity of a regular slot on the Londolozi blog, there was no doubt in my mind that I wanted to showcase her leopards as they are what drew me here in the first place and are the reason that I get out of bed each morning. That being said, my goal is to tell the stories of the Leopards of Londolozi through my photography, writing and videos to give you all an insight into what we experience on a daily basis. I hope to share my passion with all of you and I have no doubt that once you have followed the trials and tribulations that these animals face on a daily basis, you too will develop, at the very least, an affinity for the Leopards of Londolozi. To whet the appetite, here is a series of photographs demonstrating the athletic ability of the Vomba female, no mean feat given that she turned 14 last December. 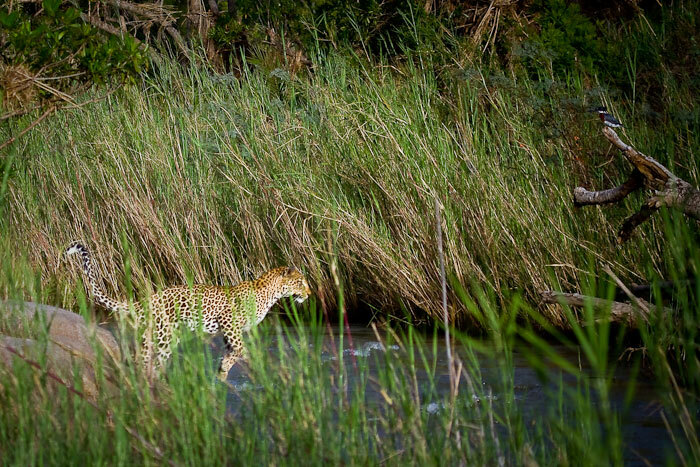 We set out with the intention of trying to photograph a leopard and didn’t have to wait long before we bumped into the Vomba female on the banks of the Sand River. The Vomba female has become one of the favourite and most well known leopards at Londolozi, distinguishable by her rich golden colour, which was particularly striking in the afternoon light amidst a stormy sky. It soon became apparent that she intended crossing the river and we had just enough time to manoeuvre the vehicle and tweak our camera settings before she started her boulder hop to the southern bank. She navigated the first couple of rocks quite easily before she perched on a large granite boulder. The Vomba Female lines herself up on the boulder. After just a split second she took the plunge and launched herself off the boulder. 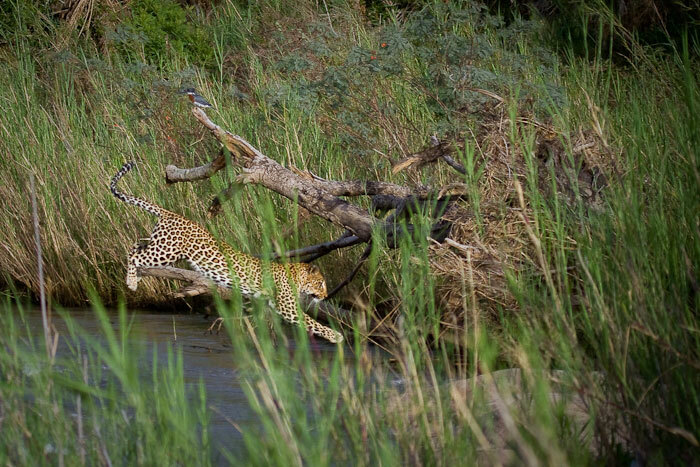 With shutters firing away we managed to capture a couple of frames showing this remarkable athleticism. She made the jump seamlessly and carried on with her crossing as if it was nothing out of the ordinary. One couldn’t really ask for a better example of being in the right place at the right time. To round it off, a giant kingfisher was perched behind her throughout the entire episode and seemed unmoved by it all. What a beautiful sequence of images! I look forward to reading more of your posts James. Great shots James. Looking forward to more. What a beautiful animal, and wonderful photos. Right place at the right time for sure. What amazing photos this allowed you to take. Thank you for sharing your love for these amazing cats. Good stuff James – looks like you’ve got the 7D working hard for you. Looking forward to seeing more of your photos here. Thanks Scotch. I seem to be slowly learning my way around the new equipment, but it helps when your subjects make life easy for you! Fantastic shots James and well written. Can’t wait for more! Thank you. Thanks for all the comments everyone, much appreciated. I hope you will all continue to follow my weekly posts. I look forward to some interesting discussions. Awesome photo’s James so envious of what you are seeing.